After a long battle with cancer, Gihon Jordan passed away on Thursday evening. Gihon was one of the original board members of the Bicycle Coalition of Greater Philadelphia and was a longtime champion for bicyclist and pedestrian rights. Many of you knew Gihon when he was a transportation engineer with the Philadelphia Streets Department. Gihon retired in 2005 but remained active with the Bicycle Coalition board and helped win bicycle and pedestrian design changes for the soon to be rebuilt South Street Bridge. A memorial service for Gihon will be held in September at the Chestnut Hill Monthly Meeting Religious Society of Friends (Quakers). The date will be announced on the calendar at http://www.quaker.org/chestnuthill/. I got the call about this while watching the Olympics on Friday. The call came just as a memorial was displayed on the screen for veteran sports reporter Jim McKay. It honored him as a "friend, colleague and inspiration." Having known Gihon for less than a decade I hope it is not presumptuous to apply those same words to him. Gihon - may the winds always be at your back as you cruise the never-ending cycle of life. I could go on and on. And Gihon should have gone on and on. So sad to hear of his passing. When I heard Claudia’s voice on my phone, I knew it was about Gihon. I moved away to Boulder, CO almost 3 years ago, but every time I returned to the Philly area to see my mom, I treasured being able to visit with Gihon and Susan. Claudia told me about the Bike Coalition blog and when I searched for it, I found this great video of Gihon as well. You can hear John filming. I love that even though it looks like this is 2007, Gihon is wearing a Freedom Valley Bike Ride shirt from one of the years that I ran the ride (sometime in the late 1990s). I love that he is so caught up in the point that he is making that he is basically standing in fast moving traffic. The video perfectly captures his unique gestures. If you want a 15 second glimpse of Gihon, this video is it. The 1990s were a great time for the Bike Coalition. We had growing pains, but we grew into a real organization. We accomplished a lot during that time, despite the fact that bikes were still considered fringe and not any kind of real solution – much more so than today. In Philly, and many other places, it was the time where we struggled to get bikes to table. We did that and more, and it could not have been done without the team of people we had- Gihon was very much a part of that. I still work in bikes today, and Gihon and the others who were part of our struggles and successes have given me my long, enjoyable and productive career in bikes. But mostly, Gihon was a friend that I love. He made me laugh. He gave me a number of phrases I use all the time. He visited me during my short time in VT and we went on a great bike trip. He made going to the bike/ped mtgs in Harrisburg fun (the fun was all in our antics on the train where we sneak in beers, etc). He helped me grow at the Bike Coalition from an $8 an hour go-fer to a confident Executive Director. I could go on with stories and memories. It will take me a while to process it all and find my way to honor him. But I really wanted to share that video. Life is not fair. A man who worked so hard to live a healthy lifestyle, who did so much for others, and who abhorred greed and status symbols as much as Gihon did should live to 110. I first met Gihon in 1977 at a bicycle safety conference in Washington. Those of you who thought Gihon was wired and energetic in more recent decades should have met him back then! Gihon was born to be a counterweight to mellow people. He worked hard to be practical, but I could count on him to speak up when he saw compromising core principles for political reasons. Gihon always had a laser-like focus on the welfare of cyclists and pedestrians. I will cite one very small example: In the sections of Philadelphia where Gihon had traffic engineering responsibility, he knew exactly what percentage of the population didn't have driver's licenses, and used that knowledge to badger the city bureaucracy to do a better job for those residents. He knew exactly what good engineering practices were and were not being used enough in Philadelphia, and as far as he was concerned, adopting the good ones should be done. . . today. In the last 15 years, he and I worked together on many cycling projects, and I always valued his advice and insight. One project in particular was his hard work selecting -- and getting approval for -- the 250-mile route of BicyclePA Route L. That was a hugely ambitious project, and he did it well, despite many bureaucratic obstacles. Gihon's stories of his many bike touring adventures were inspirational -- and even baffling, so ambitious were some of them. Gihon was on one hand bawdy and loud, and on the other hand supremely sophisticated. His appreciation of fine culture -- the symphony orchestra, the art scene, unique ethnic foods -- ran far deeper than mine ever will. (He disapproved of the poor taste displayed in my rum collection, and in truth, his was far, far better.) I was a more even match for Gihon on the bawdy side. And what an intellect! He had a fistful of degrees, was very well read, an astute student of current events, and knew both his engineering speciality and the world at large supremely well. About three or four times, Gihon rode his bike the 50 miles from his West Philadelphia home to stay in our guest house in Coopersburg. His visits were always an adventure and source of entertainment. I always wanted my kids to pay attention to Gihon, because I knew they could learn so much from him. We should all strive to be a little bit more like Gihon. I never learned to ride a bicycle as a child. Gihon is one of the four people I thank for helping me learn as an adult. I’ll never forget the training ride he gave me in West Philly when I was in law school. I was pretty terrified riding in the city, but his calm, patient coaching got me through the ride. I can’t say I really learned that day, but about 15 years later I bought a bike and began to seriously ride. Just two years ago, Gihon was healthy enough to join a ride with Susan, the Bergbauers, my wife, our children and I in Ventnor, NJ; it was the only bike ride I ever took with him since that first ride almost thirty years ago. Gihon was derisive of my signaling right turns by raising my left arm, as drivers did before directional signals. Even after all those years, I was still reluctant to let go of the handlebars with my right (power) arm. But Gihon’s critical comments were enough to convince me to learn. The one thing Gihon was never able to teach me was how to drink from a water bottle while riding. My childhood fears just won’t let me master those skill sets. So I bought a camelback. Thanks to Gihon, I can easily ride enough miles to justify the purchase. I think of Gihon every time I ride. His spirit will always ride at my side. Gihon talked to me about his long bike rides to Coopersburg, PA (mentioned by John, above) and I was always so impressed by where he was able to travel by bicycle. I frequently ran into Gihon on the streets and bike paths of Center City, West Philly and the Wissahickon. Often I would yell and wave as he rode by on his bike. Other times I would see his bike (with all that distinctive gear) locked to a rack and I would know he was nearby. We went to the Corestates bike race in Manayunk together. Gihon and I were co-workers at the Philadelphia City Planning Commission, where he was employed prior to going to Streets Department. Gihon was smart, passionate, committed, warm, friendly and fun ... and I am so saddened to learn of his passing. I had the pleasure of meeting Gihon several times over the years and talking bikes with him. It's a loss for the Philadelphia bike community and for humanity in general. Tailwinds, Gihon. As SEPTA's ADA Coordinator, I worked with Gihon for many years on the Transportation Committee of the Mayor's Commission for People With Disabilities as well as on SEPTA projects. I was happy to see the photo of him at SEPTA's Wissahickon Transportation Center and glad the new facility worked well for him as a user as well as an engineer. Gihon drew on a prodigious memory for every detail of intersection use and design in his districts. He was unwavering in contending that pedestrians' needs must include ALL pedestrians--people with mobility, cognitive, and sensory disabilities, as well as non-disabled individuals. 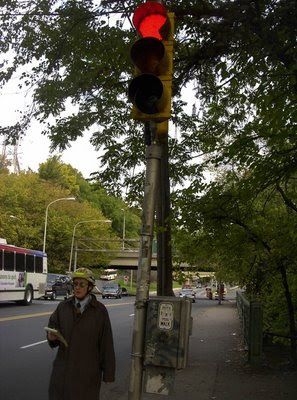 He advocated tirelessly for many years for updated pedestrian signals and tested their effectiveness in pilot projects. These are now being installed in major intersections city-wide. Nationally, Gihon was one of a small group who helped give new directions to recent national transportation research and design. His continued advocacy bore fruit in recent national initiatives for disability-friendly intersection designs and pedestrian rights of way. He was a long-time significant presence in US Transportation Research Board activities. Gihon was generous in sharing TRB information and insights, helping people flesh out proposals or prepare applications, offering contacts, but it was typical of him that he also did the essential but non-flashy scut work of proposal reviews for his committees. A lot of people in this city, and outside it, are able to get where they need to go more safely and expeditiously thanks to Gihon. He was a worker as well as a thinker and a dreamer. He was also a very entertaining guy. Ride on, friend. I have known Gihon since the days we both went to Edison High School in NJ. He was my acid test for friends in those days -- if folks misunderstood his style and didn't like him, then I felt that they probably weren't folks worth befriending myself. Yes, he liked gourmet beer even back then, and he introduced me to its joys in an era before boutique breweries became the fad. He liked Hop n Gator too, but I guess we can give him a pass for that right? :) Oh yeah, he liked his rum too. Unfortunately, as we often do in this life, we lose touch with friends and then one day it is too late. Gihon held up his end and tried to keep us together. The regret is now all mine. Have a Hop n Gator for me GJ! It was only on a few occasions we actually met but when you are 3500 miles away it is a bit impractical to nip round and go out for a meal. You always took that modest line - and never forced an idea on others rather more convincing them that they had thought of it with you.